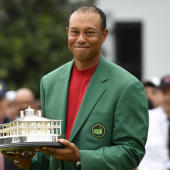 AUGUSTA, Ga. -- The 2019 Masters is doing what it can to avoid its first Monday finish since Seve Ballesteros slipped on a green jacket in 1983. In order to meet this goal, Augusta National announced that Round 4 will begin at 7:30 a.m. ET on Sunday with golfers being sent off both the No. 1 and No. 10 tees. Play is expected to wrap up around 1:30-2 p.m., just before thunderstorms threaten to invade the pristine course. CBS will broadcast the final round live at 9 a.m. with live streaming coverage on CBSSports.com and the CBS Sports app beginning with the start of the round at 7:30 a.m. The leaders -- Francesco Molinari, Tiger Woods and Tony Finau -- will tee off at 9:20 a.m. [get the full list of Sunday tee times here] as everything is bumped up about six hours to avoid late afternoon thunderstorms that could otherwise move the finish until Monday. "The safety of everyone on our grounds is paramount," said Fred Ridley, chairman of Augusta National Golf Club and the Masters Tournament. "We also believe the earlier start will give us the best opportunity to complete the Masters on Sunday. This decision should benefit everyone - the players, our patrons and our fans watching around the world. Given the competitiveness and drama of this year's Tournament, we look forward to an exciting conclusion tomorrow."